The strike in Garforth assumed a very serious aspect yesterday. At noon the villagers, with the exception of a few who had heard of what was about to take place, were surprised to see crowds of men armed with sticks, entering the village. They came in hundreds and very soon some four or five thousand determined-looking men had assembled on Garforth Bridge. It was evident that something serious was going to happen. The crowd which every minute was growing greater, marched in an excited manner to the town end, and there a mass meeting was held. After the speaking was over the assembly moved towards the station bridge, and thence proceeded to the Garforth Pit, hooting and shouting all the way. Mr Routledge the manager for Colonel Gascoigne, the owner of the colliery, was evidently aware that some disorder was about to take place, for he was waiting along with Mr Prater, the agent for Colonel Gascoigne, Mr. Allison, the shaftwirght, and several deputies, under the shoot by which the coal is emptied into the railway waggons. The crowd swarmed onto the pit bank, and some three or four climbed to the top of the shoot. One man who carried a stick, leant over the shoot and struck the manager a severe blow on the side of the head, knocking him down. This dastardly act served to increase the excitement, and the crowd was evidently about to rush upon the manager and those along with him when a small band of about eight constables, headed by Sergeant Chalkley, interfered. Chalkley spoke to the man who appeared to be the leader of the mob, and this individual said he would quieten the crowd if he were allowed to a have an interview with the manager. An interview was granted, with the result that the manager promised that work in the pit shall not be resumed until the dispute is settled; and some three or four of the men were allowed to go down the pit in order that they might see whether men were working or not. They found that no work was going on. In the meantime Allison, the shaftwright, had been struck in the face with a stick. Colonel Gascoigne [Aged 79] rode up on horseback just at this time, and it was probably fortunate that he was not recognised. The crowd afterwards went to the other pit [Isabella Pit] in the neighbourhood owned by Colonel Gascoigne, and it was also explored with a view of seeing whether anyone was was at work. As at the first-mentioned colliery nobody was below, but it was considered necessary that something should be done by way of intimidation, and a number of windows in the pit buildings were broken and other damage committed. The next place visited was a row of colliery cottages known as New Hold. It was believed some of the men living here had been working in the pits since the strike commenced and it was determined to extract a pledge from them that they would not do so again until the dispute is at an end. Several men were brought out of their houses and made to sign a document to that effect; and they were then taken to a mass meeting, but not before a certain amount of damage had been done to the property. Moreover the men were somewhat roughly treated. Briarlands another row of houses in the neighbourhood, was next visited. The proceedings here were similar to those at New Hold. Attention was afterwards given to Paradise-row. Here a number of windows were broken. Frank Hancock, a deputy lives in this row, and when it was found that neither he nor his family were at home, the crowd broke into the house and smashed the windows and wood-work. The cupboards were opened and the crockery smashed and it is alleged that the food found was carried out and eaten in the road. From there the rioters went to the meeting which had been organised in the football field, and the men who had been dragged out of their houses, some in their shirt-sleeves and without hats, were compelled to accompany them. One of the houses visited was that of a deputy named Chadwick. Fortunately he was not at home. His windows were broken, and when the strikers retired they intimated that when they came back that way they would call for a couple of hams which they saw hanging in the house. One of the men visited refused to come out of his dwelling. The windows were smashed. When the last house had been visited, the leader of the strikers addressed the crowd. He said, "We have gained a victory to-day with credit, and we will gain another tomorrow." None of the Garforth colliers joined in the disorderly proceedings, but it is thought that one or more of them must have taken the strikers to the houses they visited. During the afternoon Superintendent Stansfield arrived from Leeds, and assisted in restoring order. It is said that only some 50 or 60 per cent. Of the crowd were colliers, and that the remainder were roughs who had assembled simply to gratify their mischievous propensities. The strikers were heard to say that Waterloo Main Collieries would be visited to-day, and those at East Ardsley to-morrow. Since the strike commenced, no coal has been got out of the collieries at Garforth, and only some dozen men have been employed in keeping the pit in repair. These were stopped on Friday, and since then the only men employed have been the engine and fire men. It is thought that the Garforth pits were visited owing to a rumour that 400 "black sheep" were working in them. This has not been the case. It is alleged that a watch was stolen from deputy Hancock's house. Following the article a further reference to the strike was placed in The Leeds Mercury, Friday, September 15, 1893, when a meeting of the West Riding Magistrates in Leeds noted that; "Both Colonel Gascoigne and his son are magistrates and owners and for the time being they have taken up residence at the Garforth Colliery." 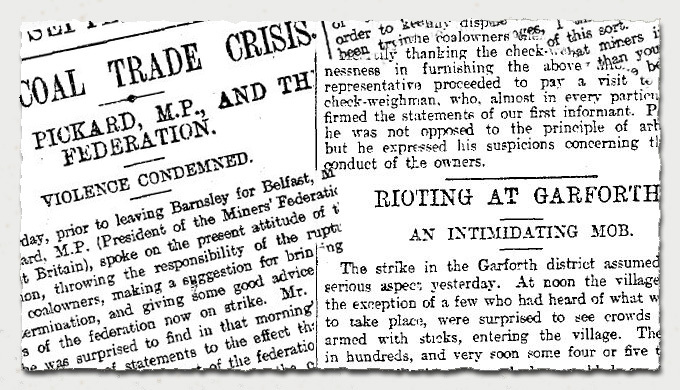 Like many incidents the genuine miners at the meeting who were striking to improve their working conditions, were subsumed by the anarchists, simply bent on creating havoc, doing more damage to the legitimate cause. But the entry to the scene, albeit unrecognised of Colonel Gascoigne, mounted on his horse at the age of 79, is very dramatic. Such action shows that he was not a man to avoid his responsibilities. The article does not mention whether he was accompanied by any other riders, although the Gascoigne agent Herbert Prater was at the mine. The Colonel must have ridden down from the Hall, along the Flyline, beside the railway track!